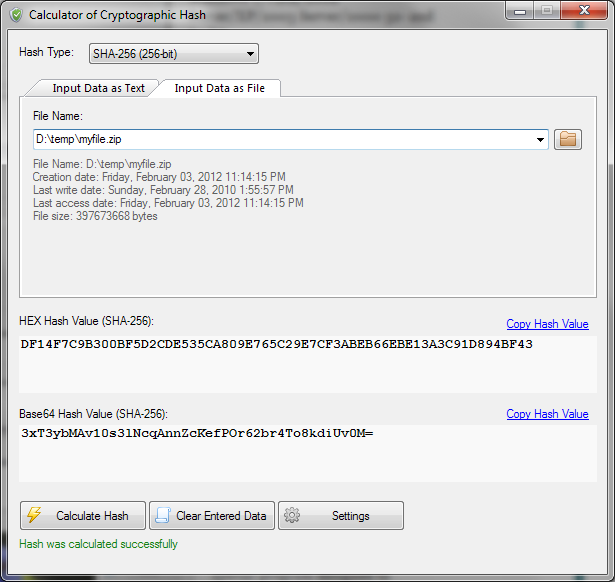 VSCryptoHash is a cryptographic hash calculation software. Simply drag and drop files (or type the text) in this calculator and hash string for the files (or for entered text) will be immediately displayed. VSCryptoHash is a cryptographic hash calculation software. Simply drag and drop files (or type the text) in this calculator and hash string for the files (or for entered text) will be immediately displayed. Great tool for network administrators and webmasters to calculate file control sums. VSCryptoHash supports a variety of cryptographic hash functions, including SHA-1, SHA-256, SHA-384, SHA-512, MD5, MD4, MD2, SHA-3 (224-bit), SHA-3 (256-bit), SHA-3 (384-bit), SHA-3 (512-bit), Tiger, WHIRLPOOL, RIPEMD-128, RIPEMD-160, RIPEMD-256, RIPEMD-320, Panama, Adler32, CRC-32. Ever wanted to slag off your so-called 'Facebook friends' without them knowing; or tell your workmates what you really think of the boss without him ever finding out? Crypto them! It's quick and easy and a lot of fun, too! USB SAFE - Lock & Encrypt USB - Password Protect USB & External Drive. USB SAFE Lock, Encrypt and password protect USB drives, External drives and all Portable drives. USB Safe gives Complete USB Security in just one click Cross Platform Protection. Cryptra is an unbreakable encryption program for sending encrypted email attachments and/or the secure uploading of off-site backup files to remote servers. One Time Pad (OTP) encryption is used. This program builds you a Key on a USB flash drive. BitSec Secure Folder (Free Edition )is an excellent and professional folder locksoftware, which could help you to lock important data. This Folder Lock tool can safely protect any file and folder on your PC from being seen, read or modified. Haihaisoft DRM-X 3.0 Desktop Packager is a powerful All-in-One packager to encrypt Audio/Video, PDF and ePub documents. It's easier for content providers to protect digital content. Encrypt word document to Prevent copy,Prevent edit,Control print, and authorize to read.Stronger than the office's own encryption. You can encrypt word document into exe files that can only be opened when a Read Password is provided. Click to Encrypt PHP was designed to help secure your web page source code from prying eyes, providing you with a 64 bit Encryption! This is LHN's CryptoText, a free and easy to use file editor that simply allows you to crypt and decrypt your messages. For example you can decide that only some people can read a post that you leave on a social network. Forgot your password for Microsoft Word? Get the maximum recovery speed on your computer. Try it out! Software works with all versions of Word (from Word 2 to Word 2013) and recovers any type of password faster than other solutions. This site does not contain serial number, crack, keygen VSCryptoHash serial number : serial number is the simplest type of crack. A serial number(cdkey,product key,etc) is register the program as you may already know. a crack or keygen may contain harmful software. If you cannot find the exact version you want, just give it a try. for more information read .nfo/.txt/.diz file include in zipped file.